I love so many things about this time of year. So. Many. I don't even know where to start. Sometimes, I sit down to write a blog post and my mind just starts spinning with all the crisp-air-apple-pie-pumpkin-spice-boots autumny things. It's hard to narrow it down, as you may be able to tell. I'm not sure how long this will last, but this time of year also brings me back to fall Tokyo. It felt like an eternity before the leaves would start changing and the weather became perfectly chilly for things like hot chocolate, yakiimo, and roasted chestnuts. There were streets lined with Gingko trees that became shockingly yellow, creating an amazing golden light that you don't expect to see in a massive city. My favorite trees, no matter the season, were Japanese maples. Their small, star-like leaves were memorizing. I used stand beneath the branches and stare up at the bright red stars, their little points overlapping and creating perfect patterns and an endless blanket of autumn beauty against a brilliantly blue sky. That, among other things, is where my mind wanders when I start making my fall favorites like pumpkin muffins (coming soon!) and this apple butter. Apple butter is one of those things I make when I have an overabundance my favorite fruit. When fall arrives, I stock up on all my favorite apples and I'm blessed to have friends who bring bags of apples from their backyard trees. I'm convinced I could never have enough apples around, but having the space to store them is another issue entirely. So, when I start to feel a bit cramped, this apple butter is a perfect way to make the house smell incredible. It also helps me hold on to my favorite seasonal flavors for as long as humanly possible. 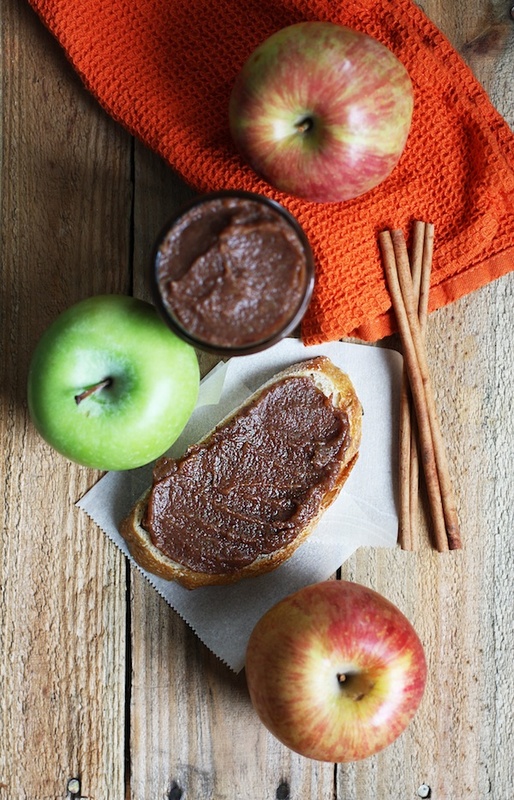 What makes this apple butter better than all the rest? Yep. I heard you. Most recipes call for quite a lot of brown sugar, which is delicious but not so much good for a person who might need to have apple butter every day. *raises hand guiltily* Instead of packing this apple butter with sugar, I added several dates to provide a sweetness quite similar to brown sugar without all the...well...sugar. Here's what you should do as soon as possible: get the ingredients you need for the apple butter, get them going over low heat on your stove-top or in your slow cooker, and sip on some hot cider while mulling over all the reasons why this is greatest time of year. Because, let's be honest, it just is. Remove the apple butter from the heat and cool completely before putting in a jar with a tight-fitting lid. The apple butter will keep in the refrigerator for about 2 weeks and tastes fantastic spread on toast, muffins, or with savory items like pork tenderloin or chicken.